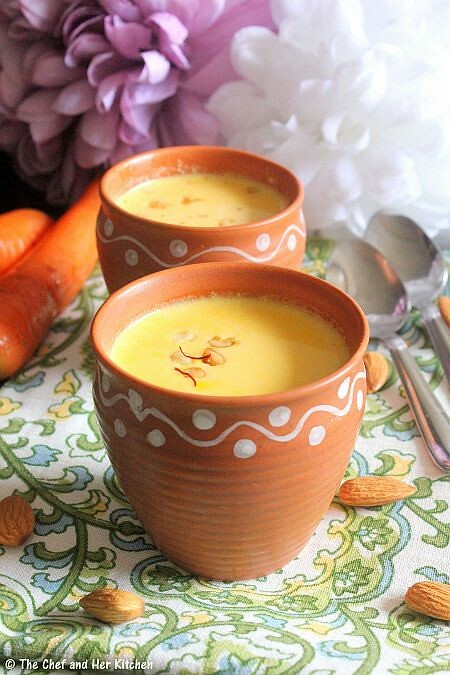 I like kheer varieties like Badam kheer, Moong dal Kheer, Carrot Kheer that are thinner in consistency compared to the regular varieties of kheer..Moong dal Kheer and Carrot kheer are prepared quite often at our place, as are less fatty and use less sugar. Its also also quite easy to make as we do not need to cook them for long to make it rich. It also gives a nice cooling effect to the body,quite good especially for summers.While many like to eat/drink them hot/warm I prefer a cold version of those kheer varieties.There are days when I make kheer in large quantities and keep it refrigerated, and whenever I feel, I pour it in a small glass and enjoy the soothing kheer biting into those tiny bits of nuts-my favorite part of the kheer.Carrot kheer is a very easy recipe and can be tried on one of those Navratri days. Boil milk until it reduces to 3/4th of its quantity. Mean while heat ghee in a kadai/pan and fry finely chopped cashew nuts(or almonds) until golden brown and keep them aside. In the same kadai add grated carrots and saute them for 2-3mins until the raw smell slightly goes away. Remove the skins of soaked almonds. 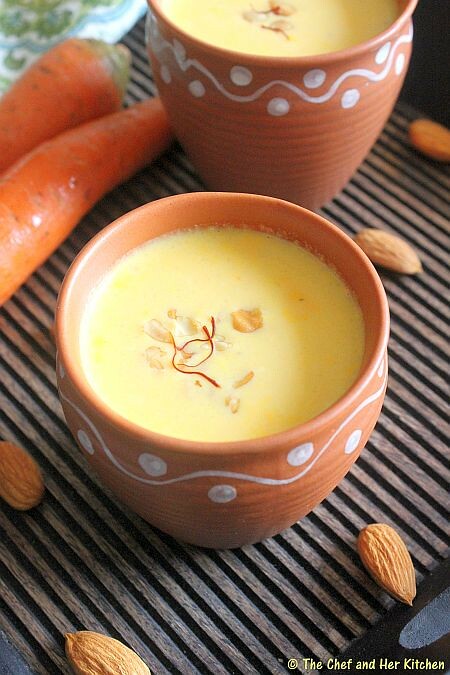 Steam the sauteed carrot mixture with the skinned almonds and 1/4 cup milk(use the milk which is boiling) for 7-8 mins.Let the mixture cool a bit. If the milk has become thick and is reduced in quantity switch off the flame and also let it stand for 10 mins so that it would slightly cool down. Now grind the carrot-almond mixture to a fine paste. Return the milk on to the flame again and add sugar(or condensed milk),ground carrot mixture and stir well and boil it on low flame for another 4-5 mins.Stir continuously which avoids curdling as well as the formation of lumps.Check the taste at this point and add more sugar/condensed milk if needed. Add cardamom powder at the end and mix well and switch off the flame.Garnish with fried cashew nut pieces or mix it in the kheer. Serve it hot/warm/cold.Garnish with saffron strands and more nuts if you want.I usually like it cold as the flavors settle well when it is refrigerated. The pics below gives a better idea about the consistency of the kheer.It should not be very thick nor thin. I prefer to saute the carrots in ghee before it is steamed as it enhances the flavor of carrots and removes the raw smell in it.Sometimes even if the carrots are boiled it has a peculiar smell and hence I recommend to saute it before steaming. 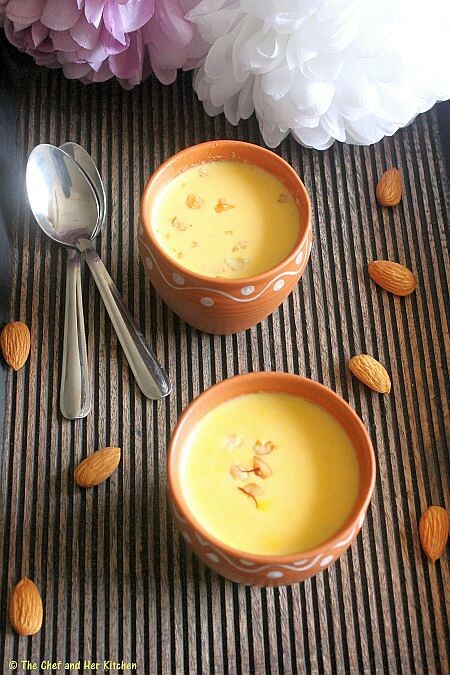 Condensed milk makes the kheer really rich,you can add either only sugar or a combination of condensed milk and sugar in the recipe and adjust them according to your taste buds.The amount of preferred sweetness differs from person to person,so adjust accordingly. As carrots give natural color I did not add saffron while it is cooking and also as I used cardamom powder I did not want to change the flavor. 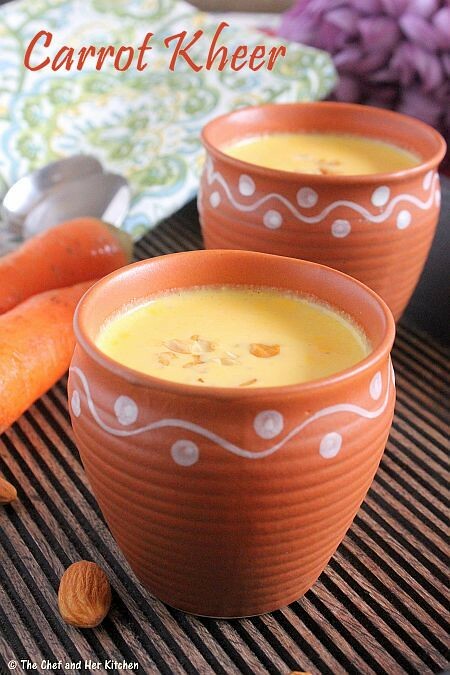 Delicious carrot payasa, I make it similarly and love it both cold & warm. 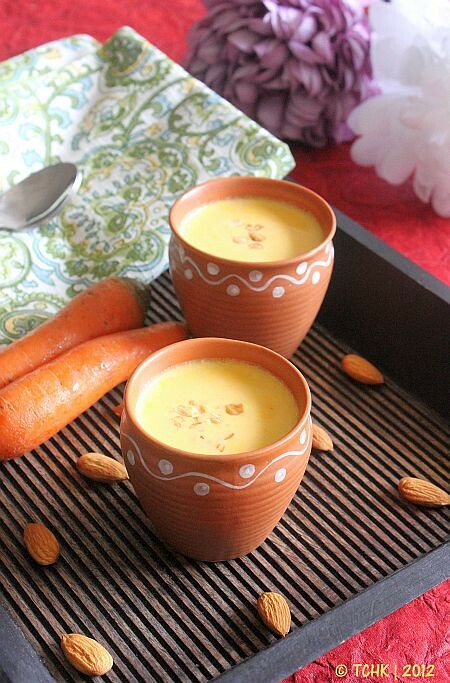 I love this Kheer.. Make it quite often...love the presentation..
never made this before! Cute presentation. Yummilicious and lovely recipe :) Loved the clicks too!! Lovely presentation, one of my most favourite kheer. 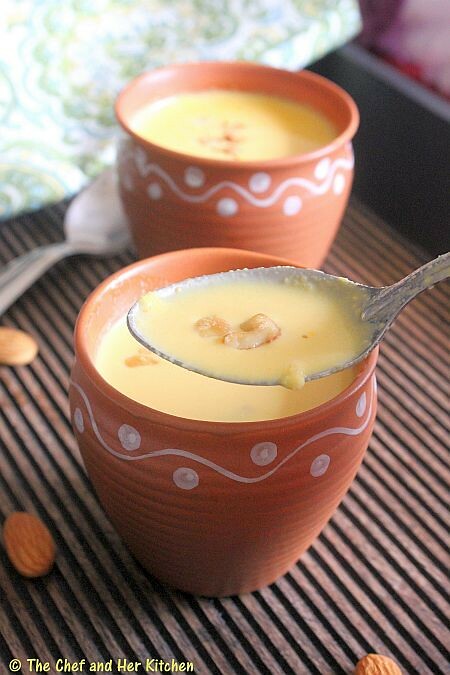 My friend makes this kheer really well and I love this chilled too! I would not mind having one variety of payasam every day ;-). Very testy kheer...i will try this soon. When you mention that the carrots have to be steamed,do you mean as in a pressure cooker? @ashwini Yes it should be steamed in cooker. love this recipe..and BTW where did u get these matkis? Tried the recipe and it came out really well :) Thanks!